Roman Ship and Tower No access, site is closed. 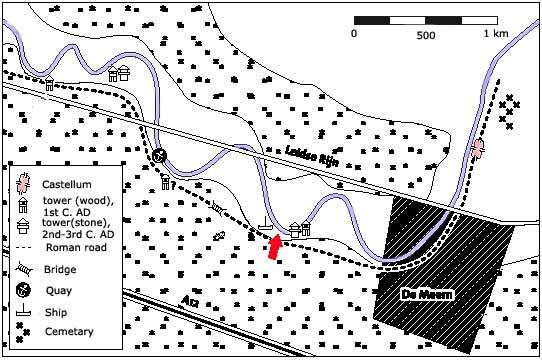 Map of the site (dark patch is the modern situation superimposed). ..with the gravel of the agger still in place, had just been discovered, when this chance .find came along. 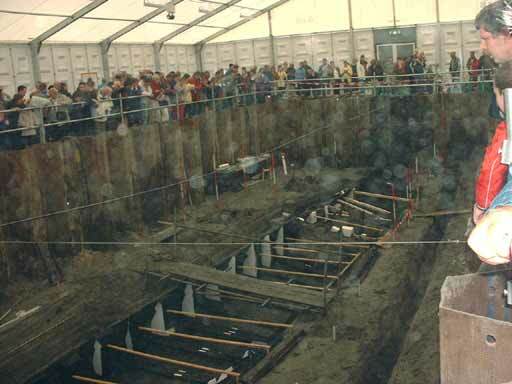 The development of houses for 30.000 people west of Utrecht was of course a big chance for the archaeologists, who hoped for several finds. The Roman fort of De Meern was long since known, but the discovery of a big Roman thoroughfare kept everyone on their toes. And much was found: more traces of that road, a bridge, a quay and finally a watchtower, which was a novelty. Then, in 1997, a chance find occurred, which led to the discovery of the ship. Two stories circulate of that find. In one, a digger hits wood in what was already a search for the Roman road. In the other, archaeologist Hans Joosten overheard a fellow traveller on the train when he tells of mysterious wood found in a building pit. In both cases, the archaeologist were alerted and hurried to the scene. Thinking of more quays, these were very surprised when the find turned out to be a ship! And not just a ship, but a real wreck in mint condition at that. When the 6 Zwammerdam ships were found in the 20th century, these turned out to have been deliberately sunk to strengthen the shore. This one, however, was still intact - a toolbox with contents came out of the mud! It must have sunk by accident rather than by design. The decision was made, nonetheless, to cover it up agian. Why? Well, to raise funds so an excavation could be carried out properly. However, by the year 2000 it turned out that the ancient riverbed still carried water, and water with too much oxygen at that. 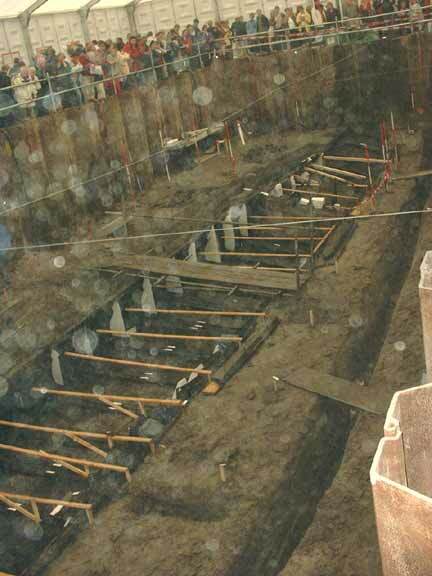 As a result, the ship would start to rot eventually, meaning that the excavation would have to get started a lot sooner. March this year, the dig got underway and a big pit was dug to reveal the ship. By June 12th it will be raised and transported to Lelystad, where a bath of ethyleneglycol will conserve it for future generations. The ship as it may have looked then, with the watchtower in the background. 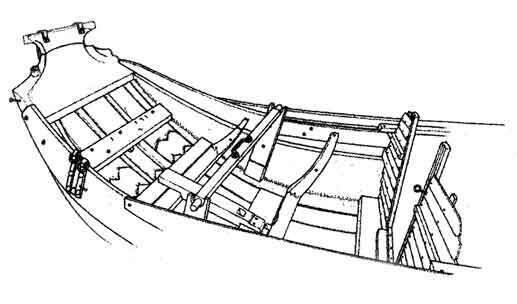 Possible reconstruction of the ship from above. 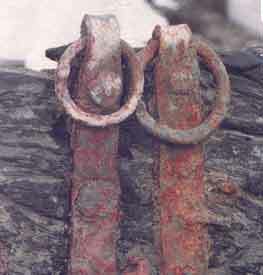 Two rings on the port side. 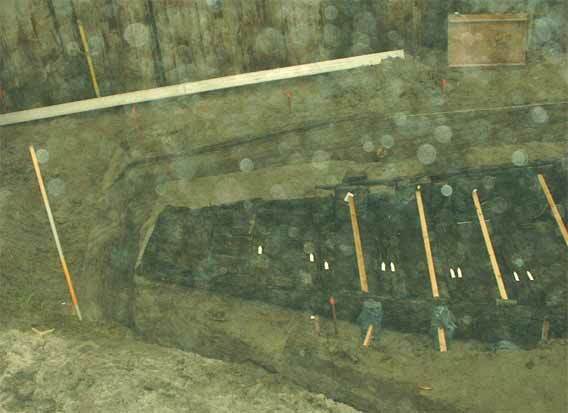 This is about the 15th Roman ship found in The Netherlands, and the best one yet. 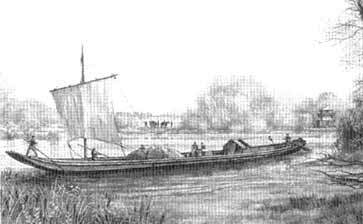 The 6 ships of Zwammerdam (3 kanoos and 3 big freighters) all had been dismantled by the Romans, but this one was still intact. More intact, even, than the ships recently found in Pisa, or the 5 transports found in Mainz. A truly unique find. The ship was once 24.6 metres long and 2.7 metres wide. It had a hole for a mast on the bow and a cabin for the captain on the stern, in which was cooked. 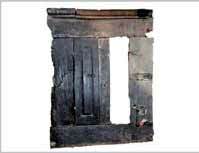 The woodwork was very luxurious (little doors, cupboards, adorned walls and bedding). This is very surprising, for until now it was assumed that all ships were built in Germany, floated downriver and were scrapped there. This one seems to point to a more continuous use. The river Rhine was 30 metres wide and 2 metres deep at the point where the ship sank, which would make manouvering a tricky thing. No local shipping, then? But during research in the months after its salvage, the conclusion was that this was a local ship after all, built of local trees, and probably scrapped after the end od its natural life. Other finds, as displyed above, included the already mentioned toolbox, a spearhead, a key, scissors, a handmill, a military shoe (sole), a coin, a stylus, a fibula, a chisel, a paddle, an axe, a knife and two sticks for unknown use. 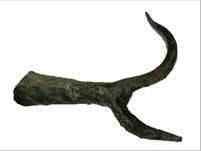 As I write this (2003/06/04), a ship's hook has just been found. 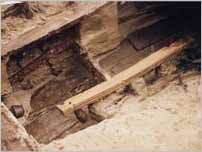 The ship itself was made of large planks of oak, which were nailed together with iron nails. The bottom was flat for docking on the riverbank. The ship was tentatively dated to around 180 AD. This proved to be a good guess, for comfirmation arrived just before the ship was lifted out of the mud, on its way to the final stage of conservation. It was already known that the ship sank right next to the Roman road, which was known to have been constructed in 125 AD. The terminus was the year 225 AD, around which this region of the Rhine was no longer navigable. A bronze coin proved too worn to recognise the Emperor, and a bronze fibula and the form of the ship added no possible dates either. More indications came from the wood from which the ship was constructed. It turned out that 3 local oak trees of at least 40 metres each had been used to build the ship, which had been cut down between 142 and 154 AD. The clues came from the kitchen. A rooftile used as a hotplate, with the inscription VEXEXGERINF (Vexillatio Exercitus Germanici Inferioris), referring to a local military unit that could only be dated to 140-180 AD, while one of the three cups found could only have been manufactured after 175 AD. Therefore, the ship must have sunk around 180 AD! When the remains were looked at more close though, the time of its demise was extended to a period betweeen 180 and 200 AD, based on the shoes and sandals which the crew had been wearing at the time of the shipwreck. A short time after the sensation of the ship, the foundations of a watchtower were found close by at Vleuterweide. This was something of a sensation, too, because such watchtowers had not been expected on the Lower Rhine. It now seems that the line of the river was much heavier guarded than thus far assumed, with watchtowers at regular intervals within sight of each other (about 1.5 km). Signal fires or smoke could alert the guardians of the next tower, so that an alarm could be passed down the line to the nearest fort within a relatively short time. The towers guarded not only the riverfront, which may not have been the actual frontier (Roman frontiers never were static lines), but also the road, which was as important as the river as a means of transport and communications. 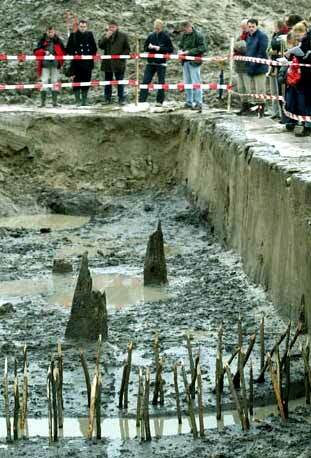 Remains of beams and stakes in the mud. 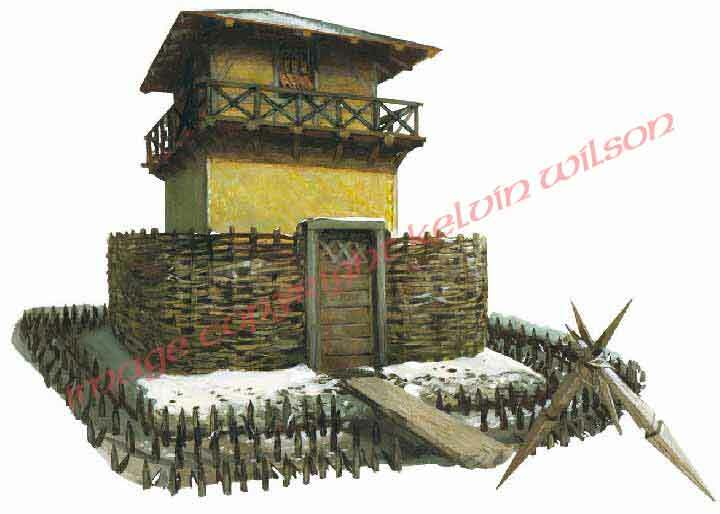 A reconstruction of the Late Roman watchtower near Heumen. The watchtower as it may have looked during the 2nd century AD. This tower was the first found in the west of The Netherlands whit a clear military frontier use. 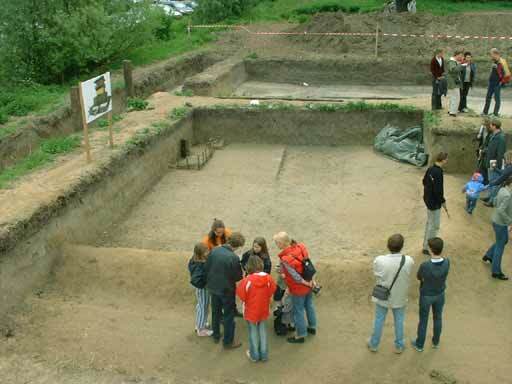 A Late Roman tower had been found earlier, south of Nijmegen at Heumen (above, middle). The tower of Vleuterweide (above, right) differs from the former in that it had a lesser wall (in fact almost a fence), surrounding it. They both had a ditch as an outside perimeter, but this one was full of water and defended by pointed stakes. Other towers, unfortunately far less preserved, had been interpreted differently, but this may soon be rectified! 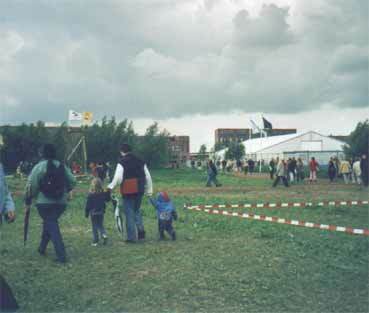 On at least 3 locations in the area west of Utrecht we can now be sure that watchtowers existed over a period of time. The Vleuterweide tower measured 3 by 3 metres, and was probably 5 metres high. It had two floors, one used by the soldiers on guard, and the other as living quarters. The tower is also unique because the wooden beams of the last building phase are still standing about a metre upright. Also, there's so much debris and remains of the earlier phases still in good condition, that reconstruction will be much easier. It has not yet been dated, but large planks, used to prevent the soil from being washed away by the river, will greatly fascilitate such dating. However, it is already known that the earliest phase may date to as early as 40 AD (which makes it one of the earliest Roman towers ever found! 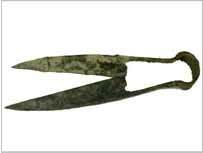 ), and the latest phase may date to around 160 AD, when all the remains were covered by the road. Other towers existed up to 260 AD. We heard of the possibility to visit the ship and the 'tower' just a few days earlier. This was indeed an opportunity not to be missed! 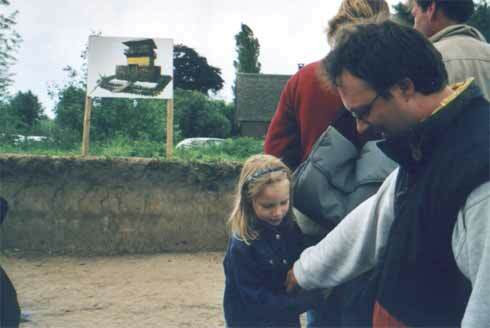 Especially my daughter Marrit, who was 6, already showed some interest in Roman things, and for me it was of course something I just had to see. The weather played along, overcast but dry, inviting the masses to come and take a look. And the masses came. During the 4 days the site was open, no less than 28.000 visited the ship and the tower. It's always interesting and encouraging to see that so many take an interest in their heritage, especially in this day and age of shallowness. However, if they all want my parking spot it's quite another matter. 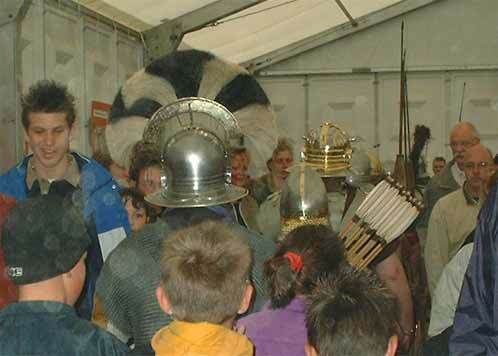 The giant tent erected over the pit was crammed to capacity (and beyond at times). The atmosphere, already very moist because of the need to conserve the ship in the pit below, was even more devoid of clear air because of the churning mass of enthousiastic people, pushing and shoving to get a better look. 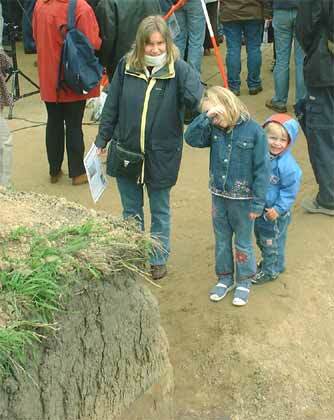 I had my youngest (Jeroen, 2) on my shoulders, but the rest of us had to wait until somebody left, to push our way through to the edge of the pit. 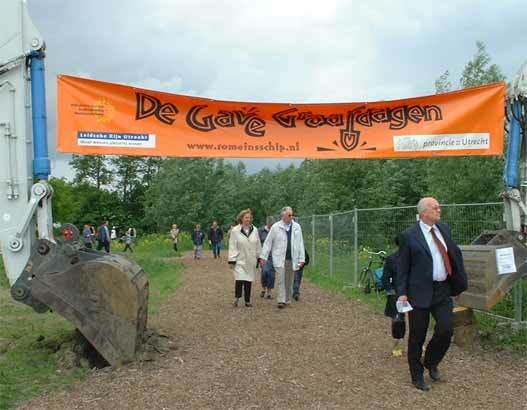 The 'Gave Graafdagen' (Cool Dig Days) was the title of the unique, two-weekend-only event. By day four, 28.000 had visited. The front of the ship, sadly obscured by much dust and moist in the air. Watching from about 5 metres high, the crowd is fascinated by the old timber below. Pano shot of the entire ship. There, several metres below us in the yellow mud, there she was. A beauty. Of course, the wood was dark, rotting no doubt in places, fresh out of the ground and still in the same mess she was in when she went down. How long ago? They're still debating that, but somewhere around 180 AD it must have been. Until 1997, when a digger ran into her hull and she was yanked into the daylight agin. And now the remote descendants of her crew, or possibly of her enemies, had come in their thousands to get a good look. It seemed they couldn't get enough. Well, the archaeological information was very well presented, with guided tours and free leaflets all over the place. And of course, there was Legio X Gemina. 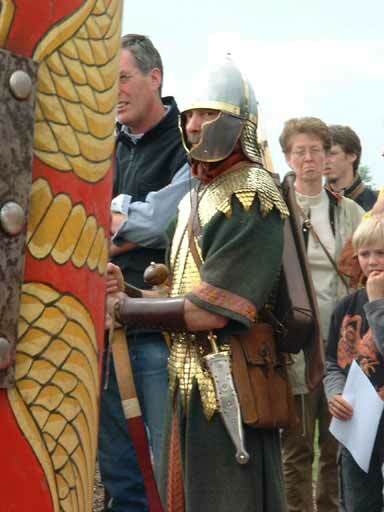 The Roman re-enactors from Nijmegen, the Gemina Project, had a small contingent which at times dared to push through the masses in the tent. Well, dared is a strong word, for their Optio had no problem bellowing his way forward, easily parting the masses as they went. 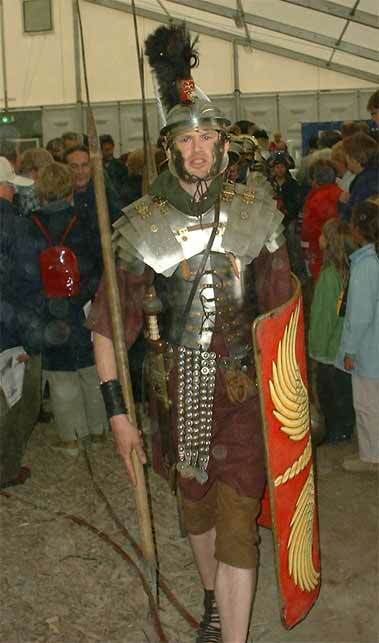 The kids were a little taken aback, but not much, as they're used to me dressing up and 'becoming' a Roman. But up close, in a heavy crowd, the guys were very impressive anyway. Time to seek better air and leave the dusty moist tent. Gone again. 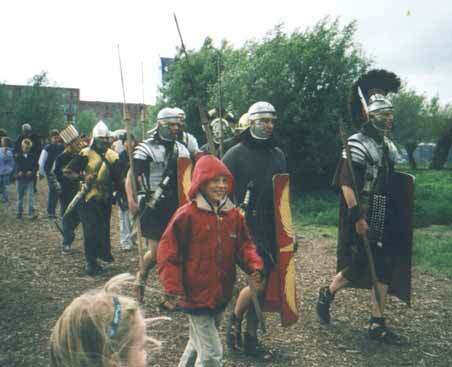 A troop of the Legio X Gemina moved through the masses, turning quite a few heads. With the weather getting worse, we walked to the tower (tent seen in the background). 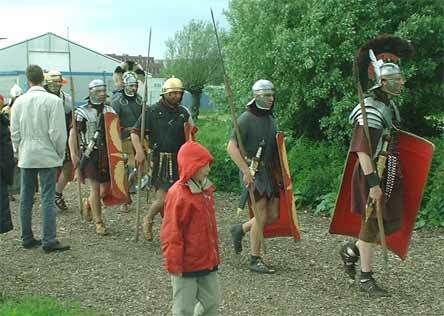 The Roman patrol moves off to the tower, too. The outlines of what was the mainstay of the Limes of Lower Germany. Marrit & me down in the pit. I guess this part was a bit less impressive..
Outside, it started to rain slightly. We moved along a well-prepared path to the remains of the watchtower. 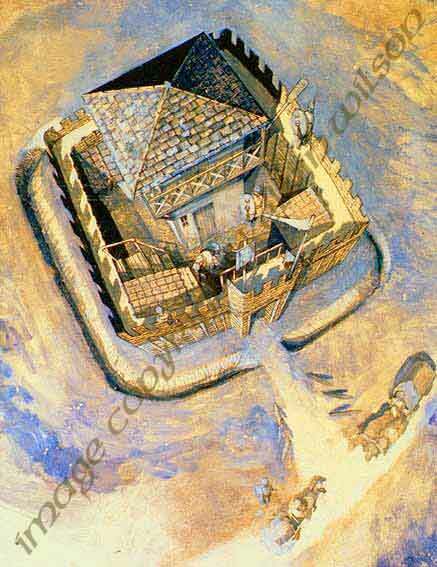 Of course, the ship being the best Roman ship they ever found, the watchtower was bound to get much less attention. A very big pit with a big bank of earth behind it was all there was to see, only the contours being visible of what must have been a watchtower on the south bank of the Lower Rhine. Only by climbing the bank did I get a bit of an idea. 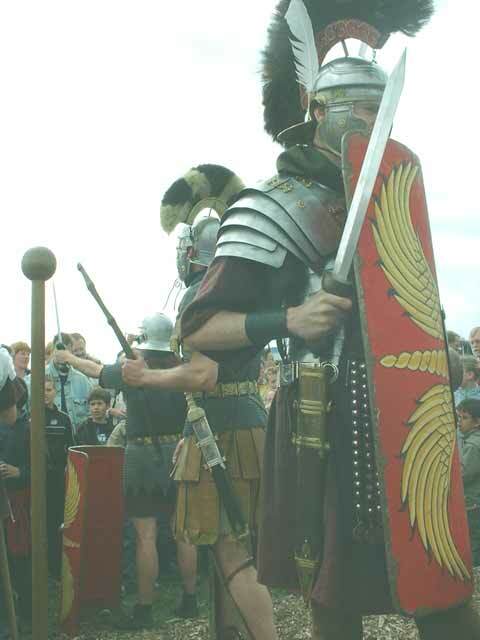 On our way back, Legio X Gemina was doing one of their displays, so we crawled through a forest of legs to the front of the crowd (sometimes it's nice to have very young kids with you) and we had a good (albeit very low) view of the action. 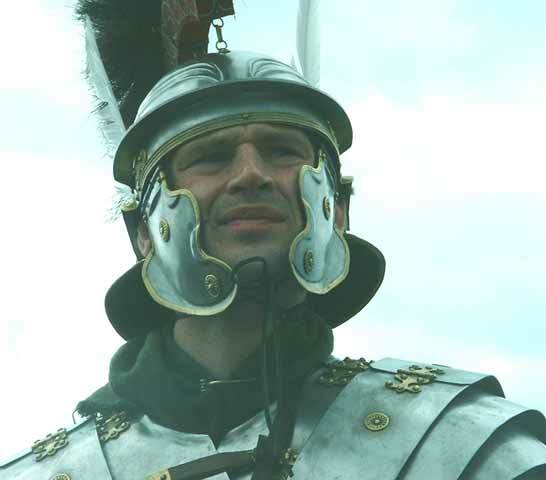 A little too close for Jeroen, and the towering legionaries were a bit too scary for Marrit as well, but she stayed put. I had to dodge a scutum from time to time, but it was a nice way to close off the visit with. Legio X Gemina on the move again. The guardian of the west. Looks the part, doesn't he? Finally, we trodded back to the car. Nice afternoon, very well spent. Link 1: http://www.archeos.nl/romeinsschip/ (Official site, with webcams).